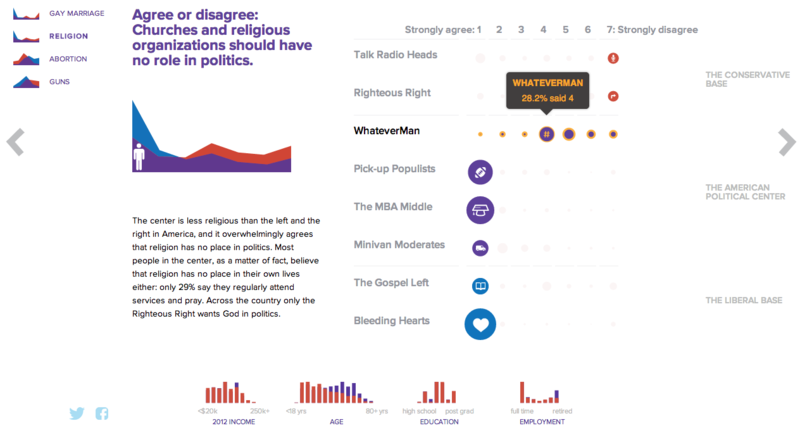 NBC News and Esquire magazine published results from their August survey of some 2000+ respondents that attempted to define the New American Center, i.e. the political persuasions of the majority of the country excepting the radical right and the loony left. For the purposes of Coffee Spoons, I am most interested in looking at the data visualisation and the infographics that result. 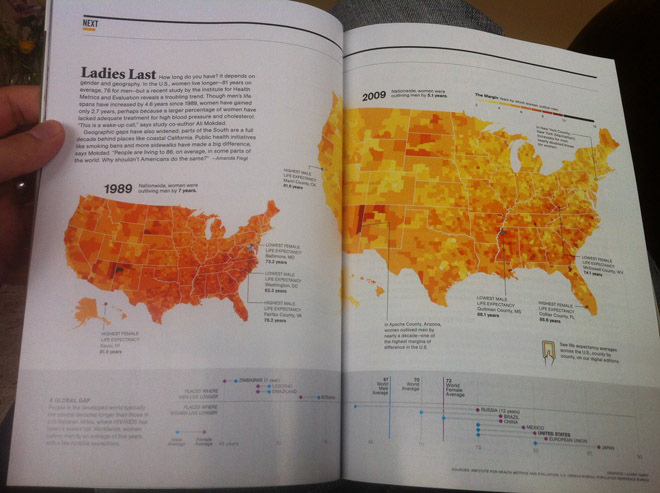 Both NBC News and Esquire visualised the results. While I could write two long blog posts looking at both of them, for today, it is more important to look more at the fundamental design difference between the two. On the other hand, Esquire opted for a more sensationalised direction. 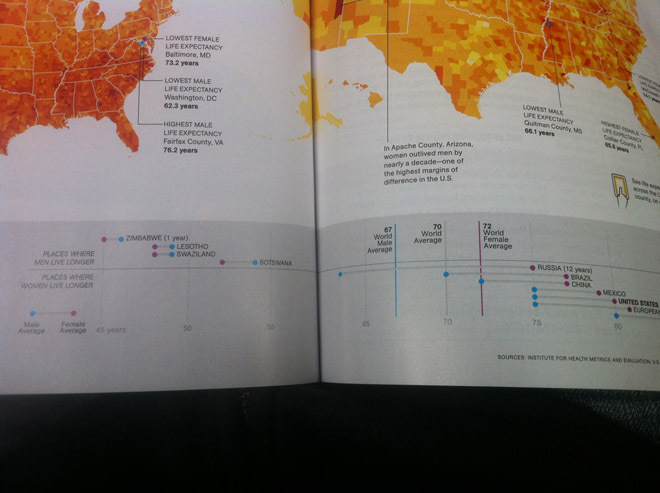 The same data points used for the screenshot above creates this graphic below. Not only is less data is contained, less context given, less subtlety and nuance captured, it also is just difficult to read. 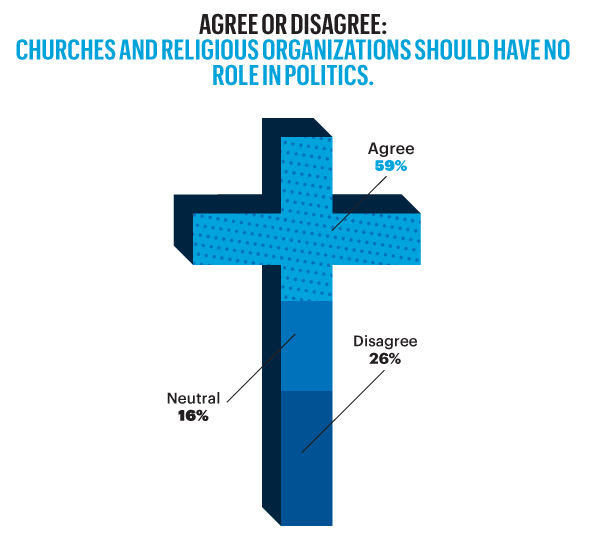 Is the 59% supposed to be the area of the cross filled in? Its length? Why is it three-dimensional? Where are the Snowdens of yesteryear? At first glance, I ignore the horizontal wings and focus solely on the vertical length of the main bar. For a useful representation of data, I think NBC News clearly wins. But that both organisations used the same data to craft their separate results, this story on the New American Center is useful for comparing two different design directions and the results thereof. No designers are specifically mentioned, at least not that I could find, so credit for each piece goes to its respective owner, i.e. NBC News or Esquire. Strikeouts are an important part of baseball. They are the moments where the pitcher wins the duel between pitcher and batter that is the essential element of baseball. 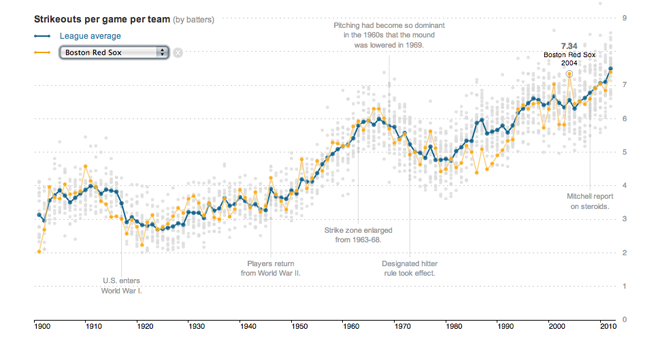 But over the years the game has seen more and more batters striking out more often. Earlier this year the New York Times looked at the rising rates of strikeouts in a story supported by interactive data visualisation components. Like the piece on Bryce Harper, this piece on strikeouts is more of a narrative with the interactive graphics supporting the written words. 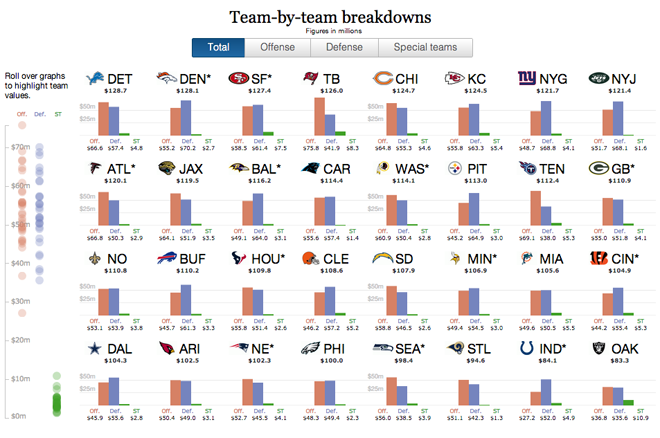 It is not as lengthy as the Washington Post’s piece, but this one is far more interactive as the user can select his or her favourite teams and follow their performance over time. Credit for the piece goes to Shan Carter, Kevin Quealy and Joe Ward. 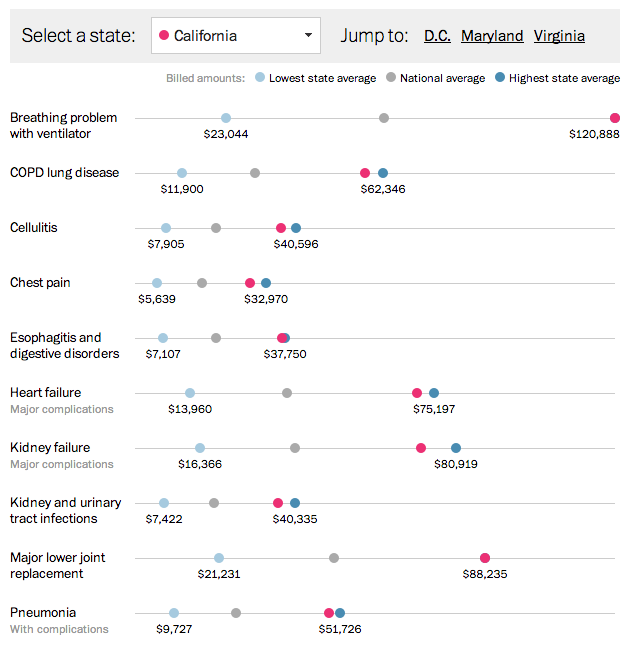 Yesterday both the New York Times and the Washington Post published fascinating pieces looking at the difference in the cost of medical procedures. But each took a different approach. I want to start with the New York Times, which focused at the hospital level because the data is available at that level of granularity. They created a geo-tagged map where hospitals were colour-coded by whether their bills were below, slightly above, or significantly above the US average. The ability to search for a specific town allows people to search for their hometown, state, country and then compare that to everyone else. My hometown of West Chester, Pennsylvania is fortunate—or perhaps not—to have several hospitals in the area that charge at different rates. That makes for an interesting story. But I am from the densely populated East Coast and someone from say rural Montana might not have the same sort of interesting view. Regardless of the potential for uninteresting small-area comparisons, once you find your hospital, you can click it to bring up detailed statistics for procedures, costs, and comparisons to the average. All of this makes for a very granular and very detailed breakdown of hospital versus hospital coverage. But what if you want something broader? 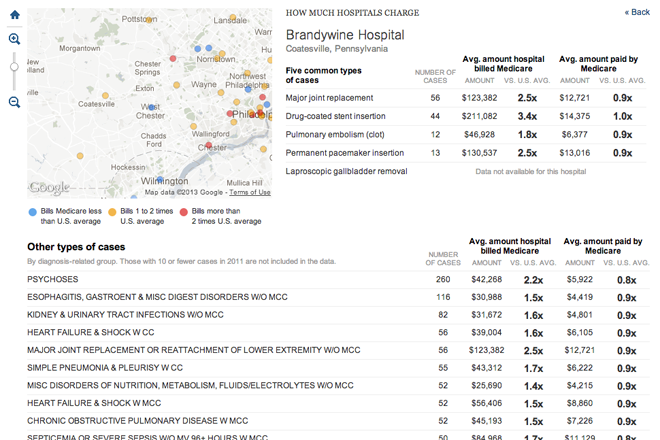 What good is comparing Brandywine Hospital to some medical centre in Chicago? Neither is reflective of the healthcare industry in the Philadelphia area or the Chicago area, let alone Pennsylvania or Illinois. The Washington Post tackles this broader comparison. The Post leads off with a hospital-level example from Miami. 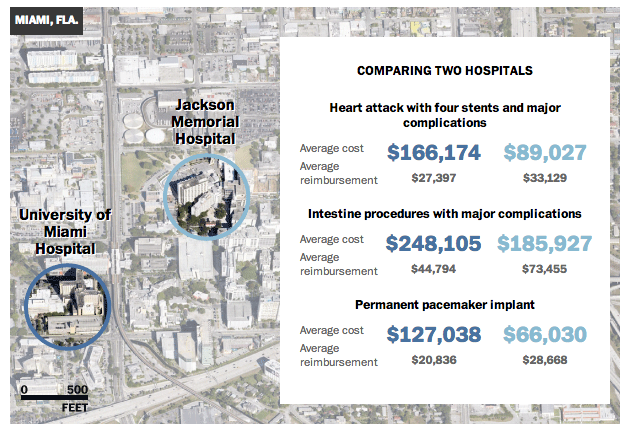 Two hospitals on one street have vastly different prices. If we knew about this in Miami we could surely find that in the New York Times map. Instead, the Post guides us to that kind of example. But the broader view is the centre of the piece. 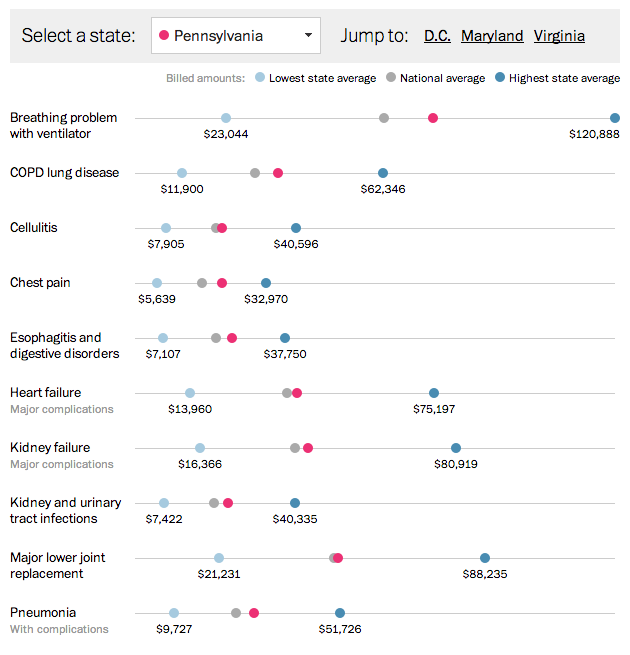 Using dot plots and filters, the user can compare the state averages for 10 different medical procedures. Fixed to the plot are the minimum and maximum averages along with the national average. And given the Post’s smaller circulation area—the New York Times is national, the Post is less so—there are quick links to states of particular interest: DC, Maryland, and Virginia. The ability to pick different states from the drop down menu allows the user to quickly see differences between states. What is lacking is perhaps a quick view of where all the states are visible so that the user does not have to click through each individual state. Credit for the piece from the New York Times goes to Matthew Bloch, Amanda Cox, Jo Craven McGinty, and Matthew Ericson. Credit for the piece from the Washington Post goes to Wilson Andrews, Darla Cameron, and Dan Keating. Following on last week’s posts on immigration comes today’s post on how that might impact Republican politics. Well I say might but pretty much mean definitely. 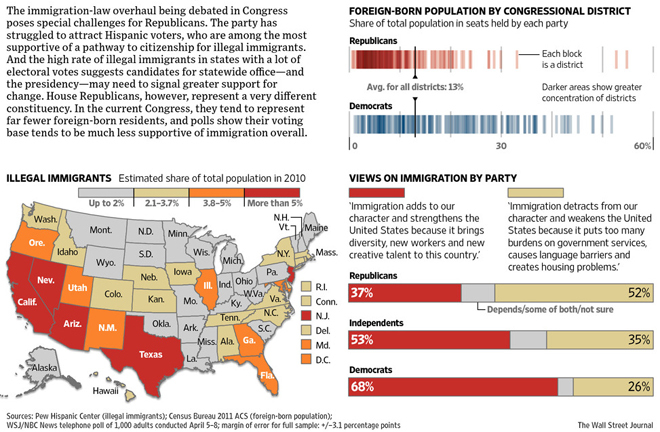 The graphic comes from the Wall Street Journal and it takes a look at the demographic makeup of states, House congressional districts and then survey data on immigration broken into Republicans vs. Democrats. I think the piece is a good start, but at the end of the introductory paragraph is the most salient point about the piece. 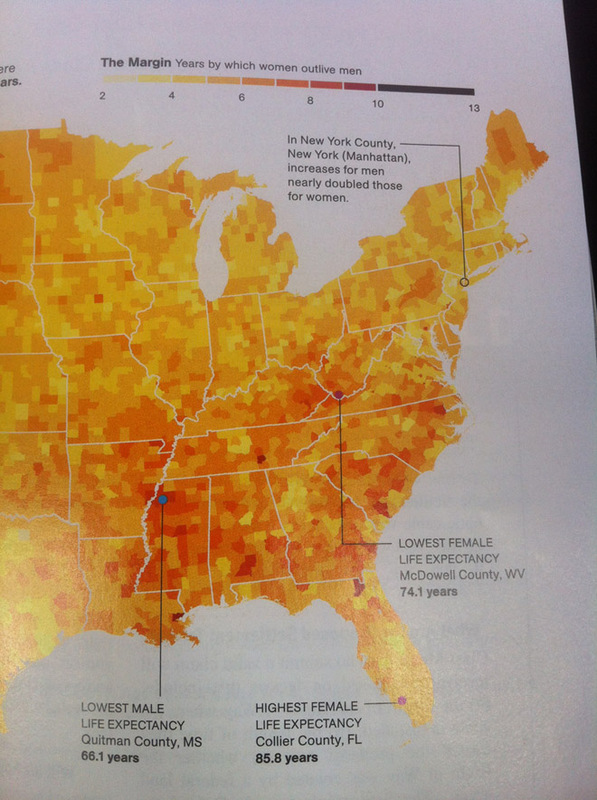 And unfortunately the graphic does not wholly embody that part. Of course within limited time and with limited resources, achieving that sort of completeness is not always possible. That said I think overall the piece is successful, it just lacks that finishing graphical point. Credit for the piece goes to Dante Chinni and Randy Yeip. Terrorism is not new to the United States. As this graphic from the New York Times shows, even in recent decades, we experienced quite a lot of it. In 1970 there were over 400 attacks. However, since 2001, the United States has seen far fewer attacks. Fortunately the Boston Marathon bombing is not as bad as it could have been. But even then, thankfully the bombing is a relative anomaly. Credit for the piece goes to the graphics department of the Times. War is good for the arms business. So a long and bloody civil war in Syria is just what arms manufacturers want. And while arming the Syrian government is fairly easy, how do you get weapons and ammunition to the Syrian rebels? 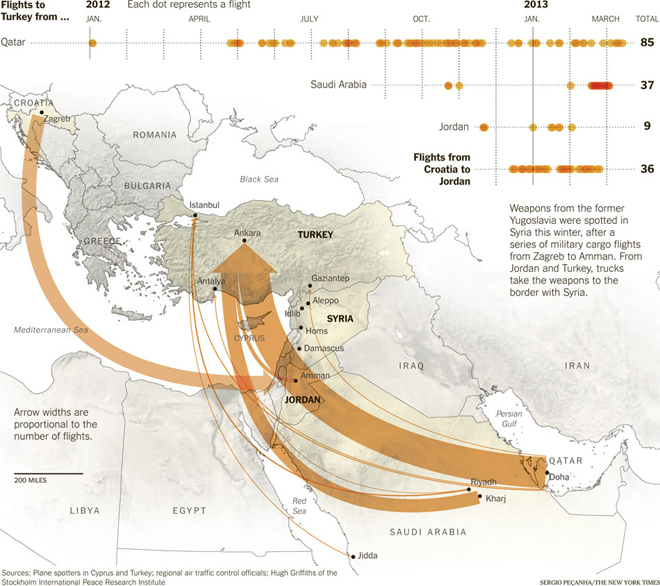 The New York Times maps the flow of arms through an almost Sankey-like diagram where the number of flights determines the width of the arrows from source to destination. And while that would be sufficient information to warrant a map, the Times adds a further layer by showing when the flights arrived. Clearly the civil war began with a certain number of arms. But as the war has both drawn on and become bloodier, new weapons are needed and ammunition needs to be restocked. Those needs likely explain a recent surge in flights. Today’s post comes via my coworker Jonathan and his subscription to National Geographic. The spread below looks at the gap in life expectancy between men and women in the United States. Outliers are highlighted by drawing lines to the counties in question while the same colour scale is used on a smaller map to look at historic data. And of course for those concerned about how the US places amongst its piers on the international stage, a small selection of countries are presented beneath in a dot plot that looks at the differences and averages. Credit for the piece goes to Lazaro Gamio. While the Superbowl was two weekends ago, I have been sitting on this post for a little while. Probably because I really just don’t understand the sport. 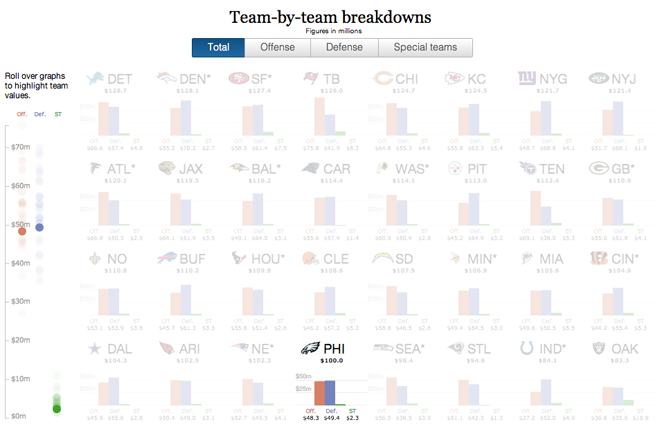 But over at the Guardian, the interactive team put together an interactive infographic that looked at payroll spending for each team by position and by overall position, i.e. offence vs. defence. Admittedly I found the position part not as interesting, probably because of my aforementioned lack of understanding of the game. But the small-multiples-based exploration of the offence vs. defence numbers was quite interesting. 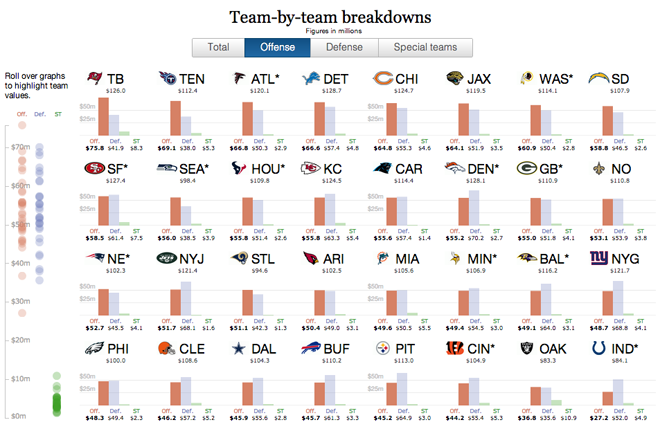 It allows the user to highlight their preferred team and then sort the view by offence, defence, or special teams. Credit for the piece goes to the Guardian US interactive team and Harry J. Enten. My colleague Benjamin Byron plays the upright bass in a few bands, one of which is named Viper’s Dream. 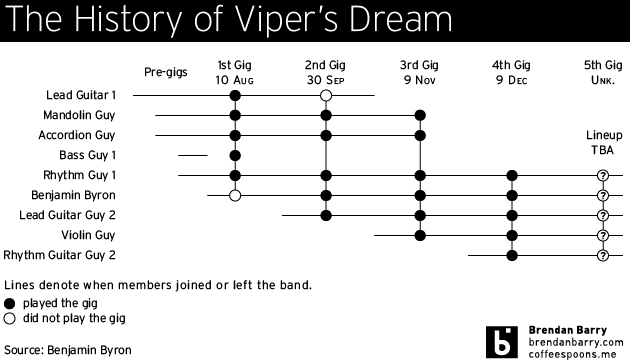 We were discussing the flexibility of jazz band rosters and I decided to make an infographic about the membership history of Viper’s Dream. Unfortunately, I know of nobody’s name but Benjamin’s, so they are all listed as [instrument] Guy. 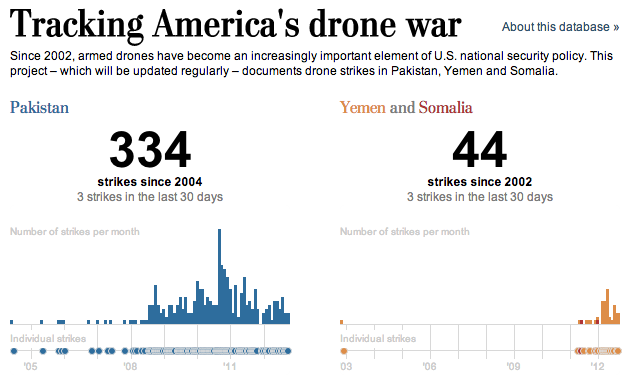 This is a small interactive piece by the Washington Post that looks at the drone wars being waged by the United States specifically in Pakistan and then Yemen/Somalia. Clicking on a specific date in the timeline brings that date into focus with articles about the attacks in question. What would have perhaps been interesting is a comparison of the number and location of drone strikes between the Bush administration and the Obama administration. Regardless, it illuminates a dark front of our ongoing wars. Credit for the piece goes to Julie Tate, Emily Chow, Jason Bartz, Jeremy Bowers, Anup Kaphle and Olga Khazan.